“Beware of Greeks bearing gifts”. Well I suppose in the current economic crisis in the Eurozone it’s more likely that our friends in the Aegean would be seeking gifts rather than bearing them – but you know what I mean. I refer to the truism th at plausible and seemingly generous offers from some sources often have hidden complications – whether (in the case of cricket) it is Allan Stanford or Sky Television, sport and especially British sport and the broadcasting of British sport, is increasingly beholden to people whose values are not really ours and who can, and do, demand a lot for their largesse. That the leaders of the England and Wales Cricket Board (ECB) are still in place despite the Stanford affair and other dramas has been a source of amazement – except, that is, to insiders who know that change at the top of the EBC is virtually impossible to achieve. Those who got us into the Stanford mess are still in power because those who put them there choose to keep them there to protect, as they see it, their own positions. Any rational observer of England’s domestic cricket scene could only but conclude that there are more than twice as many teams competing in top tier competitions than is affordable and logical. But on the irrefutable grounds that turkeys tend not to vote for a Christmas annihilation so the leaders of the eighteen First Class counties won’t vote to reduce their number. And they certainly won’t vote for a more radical Chairman who might actually do something about the mess that is English domestic cricket. So there is a Faustian (and probably unspoken) pact between the counties on one side and the current Chairman and Chief Executive on the other which maintains the status quo. The gift that these particular Greeks bear is the promise of funding to ensure that what are otherwise unsustainable “businesses” keep on going. No responsible business entity would pass good money to a subsidiary where they know that it will turn bad. But that is what the ECB does with tens of millions of pounds of money that they extract form you and me – directly though International match ticket sales or indirectly by way of our Sky Sports subscriptions. Sky Sports is the jewel in the crown of BSkyB’s properties – a source of income to Rupert Murdoch’s News Corp that is invaluable to them. Murdoch’s (now rebuffed) wish totally to control Sky is in no small way attributable to the success of Sky Sports. But for the sports with which Sky has a contract for broadcasting rights the “Gifts” that this US/Australian “Greek” brings come at a price. True the income from Sky that the ECB receives is considerable but what Sky asks for in return is substantial to. Firstly a total monopoly of live TV coverage domestic and international. There is no live cricket on British television except that on Sky - and to see that you need a subscription that costs at least £50 a month. And if you think that you can get round that by going to the Pub think again. Sky have increased the costs to pubs and clubs to such a level that it is unaffordable for many. That’s why the Red Lion in your village doesn't show the cricket or Premiership football any more! The second demand that BSkyB makes is on the fixture list. The answer to all the following questions is “Because that’s what Murdoch wants”. Why are there 43 days of International cricket in 2011? Why were there seven One Day Internationals in Australia last winter? Why is England playing five ODIs in India in October when surely the players deserve a rest. Why is the domestic Twenty20 fixture list so crowded? Why is England playing Australia in three one Day Internationals in 2012? Why will the next Ashes series be back-to-back in 2013 (in England) and 2013/14 (in Australia)? The third demand is influence. He who pays the piper calls the tune. It is safe to say that no changes will be made to anything of significance in English cricket without Sky agreeing to it. It is indisputable that the income stream from Sky to the ECB to the Counties can only exist if the content for Sky is in place. The ECB has to deliver that content – predominantly Test matches, ODIs and international and domestic Twenty20. The events of the past week which have brought the malignancy of the Murdoch empire into sharp relief present an opportunity for those who argue for change to English cricket to act. Because, as I have tried to show, the whole pack of cards is sustained only by the Sky deal. Remove BSkyB from the equation and sanity will prevail. It wont be easy – but it sure is necessary. Let’s run through the plusses. 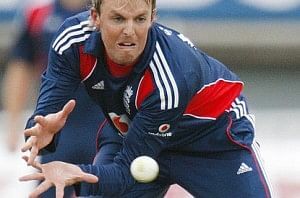 If English cricket returns to terrestrial television then cricket viewership figures would return to the levels they were when it was on Channel 4 in 2005. But there will be less money in the pot – so the ECB will be forced to so something about the unsustainable nonsense that is an 18 County structure. And for the ECB the benefit is that in a more principled media rights environment it would always be they not the broadcaster that called the tune. Our summer sport should not be in hock to Rupert Murdoch. We should not have to pay £100 for a seat in the Grandstand at the Lord's Test match or £50 a month to watch it on television. We should have competitive cricket clubs at the highest level playing in fine urban grounds with predominantly top English players in their squads. Cricket should be run by and for cricket fans not for the benefit of dubious and squalid commercial enterprises for whom the only measure of success is financial. That’s what the “Spirit of Cricket” should mean. Professional cricketers, like all pro sportsmen, have two main fears. One is that they will lose their form and the other is that they will be injured. Either can lead to a loss of place in the team and to loss of earnings – even to premature retirement. For Swann to call on a colleague to break the fingers of his opponents is about as far from the spirit of the game as you can get. It happens – but I have never heard before one bowler call upon another to injure a batsman. I know what Swann means about fast bowlers – they do need to intimidate but they need to do this fairly and not to aim not at the player’s body or hands with a view to physically damaging them. Sorry Graeme but this was an ill-considered remark and even though you said it lightly and perhaps didn't mean it it gives a bad example to all cricketers, especially young ones, as to what the game of cricket is all about.